Abstract: Sarah Nicolls’ talk will cover two topics. First, she will discuss > her project to re-design the piano. Covering the background of this project, Sarah will take us into her work with designers and engineers, funded by an array of research bodies, explicitly sharing the challenges and opportunities of cross-disciplinary work. Second, she will share her latest project, ‘Musical Activism’. 2018 saw a slew of shocking headlines about the state of our planet. Sarah will discuss her own response to this and how she works to balance the political and artistic. Biography: Sarah Nicolls is an experimenting pianist and inventor of the Inside-Out Piano, designed to enable 'inside piano' playing. 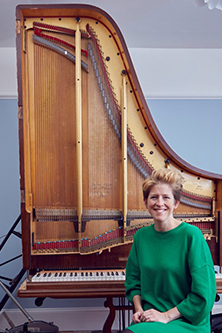 Sarah has performed in the PRSF New Music Biennial, Matthew Herbert's 20 Pianos project, premiered six piano concertos with the London Sinfonietta and is regularly broadcast on BBC Radio 3. She also makes music, theatre and installations and curates, founding her own festival of interactive electronic music. In 2017 she was resident on Southbank Centre’s Collision programme and at Artangel’s Library of Water in Iceland. She has won funding from Arts Council England, PRSF, AHRC, EPSRC, Athena Swan and Innovate UK.